The da Vinci Surgical System was like something out of science fiction when it was introduced at the turn of the millennium. While the new technology didn’t exactly replace surgeons with robots in the operating room it did offer assistance to physicians performing minimally invasive procedures. The technology soon came under question when patients and their doctors began reporting serious complications with the new machine. Studies on the robotic system have also not been able to say conclusively that there is any benefit compared to other less expensive methods already available. All of this evidence has physicians and patients alike wondering, is the da Vinci Surgical System worth the potential pain? The da Vinci Surgical System is the brand-name of a robotically assisted surgical device. It uses robotic technology to assist surgeons during minimally invasive surgical procedures. Surgeons who use the da Vinci System are still in control of the operation. The device’s mechanical arms perform the surgery inside the patient, while the surgeon control’s the robot’s arms from a console near the operating table. 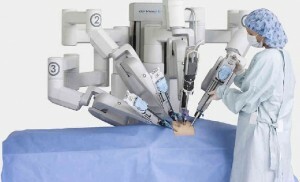 The da Vinci Robotic System, like other robotically assisted surgical devices and minimally invasive techniques, was intended to improve patient outcomes, including shorter recovery times and less pain. The da Vinci Surgical System uses robotic technology to assist surgeons during complex and delicate operations, which are performed with only a few small incisions in the patient. The robotic system is intended to perform surgeries more precisely than a human can. The robot’s mechanical arms have “seven degrees of freedom,” meaning they can bend and rotate to a greater extent than the human hand, and the surgeon views the operation on a magnified, high-def screen. Surgeon Console – The surgeon console is usually located a few feet from the operating table. This is where the surgeon sits during surgery, operates the master controls and views the surgery on a true-to-life screen that provides high-definition, three-dimensional images. Whatever the surgeon does using the master controls, the mechanical arms do inside the patient, but on a smaller, more precise scale. Patient-side cart – The patient-side cart contains the robot’s three to four mechanical arms which hold surgical instruments and a camera. The surgical tools include scalpels, forceps, graspers, dissectors, cautery, scissors, and more. What kinds of surgeries use the da Vinci Surgical System? The da Vinci Surgical System is approved to assist surgeons during laparoscopic (minimally invasive) surgical procedures in general surgery, cardiac, colorectal, gynecologic, head and neck, thoracic, and urologic surgeries. The da Vinci robot has also been used during neurosurgery procedures. Other procedures that have been performed using the da Vinci robot include nephrectomy, or the removal of the kidney, to treat kidney cancer; lobectomy, the removal of a lobe of an organ, such as the thyroid gland, lung or liver; esophagectomy to remove all or part of the esophagus; bowel resections; cystectomy, or the removal of the bladder, to treat bladder cancer; heart valve repair, including mitral valve repair; myomectomy, or the removal of fibroids from the uterus, to treat uterine cancer; and endometriosis surgery. Who makes the da Vinci Surgical System? The da Vinci Surgical System is manufactured by Intuitive Surgical Inc., a company founded in 1995 to market the new robotic surgery technology. Since its founding, Intuitive Surgical has owned or had exclusive rights to over 1800 patents, including its patented da Vinci Robot. Intuitive markets several different types of its da Vinci robot, including da Vinci Xi, da Vinci Si, and Single-Site models. When was the da Vinci Surgical System approved by the FDA? The Food and Drug Administration (FDA) approved the da Vinci Surgical System in 2000 for use in general laparoscopic surgeries. The agency later expanded the robot’s use to include cardiac, thoracic, urologic, gynecologic, pediatric, and head and neck surgeries. What are the potential complications of the da Vinci Surgical System? There are a number of potential complications associated with the da Vinci Surgical System. While all surgeries carry risks, including infections and problems with anesthesia, the da Vinci robot carries risks unique to the device. These complications can cause long-lasting dysfunction or pain and may require longer or unexpected hospitalization, according to Intuitive Surgical’s website. These complications may also require reoperation to fix the problem. How do complications with the da Vinci Surgical System occur? Many of the complications associated with the da Vinci robot occur as a result of technology failure or lack of adequate training for physicians. As with all technology, the da Vinci Surgical System runs the risk of failure during operations. Numerous reports of one or more of the mechanical arms malfunctioning in the middle of surgery have been submitted to the FDA. In fact, the FDA has received a number of device failure reports that include breakage of different components, mechanical problems and image or display issues. On its website, Intuitive Surgical warns there is a risk of surgeons having to switch from robotically assisted surgery to more traditional surgical techniques in the middle of the operation due to complications. This can prolong surgery and the time a patient spends under anesthesia which increases the risk of complications, states the company. Many of the complications that can arise from the da Vinci robot stem from accidental nicks and tears to tissues or organs by the surgical instruments. Because the da Vinci system is controlled by the surgeon, barring any mechanical or device failure, the outcome of the surgery relies mainly on the capability of the surgeon. Is the da Vinci Surgical Robot still being used today? Despite an increase in the number of adverse events reported to the FDA concerning the device, the da Vinci Surgical Robot is still being used today and its use is growing. In 2011 — just over a decade after the robot was approved by the FDA — nearly a quarter of all US hospitals offered robotic surgery, according to the National Hospital Association. In 2012, about 367,000 procedures were performed using Intuitive’s da Vinci robot, up 26% from the previous year, according to the company’s own data. Has the FDA issued any warnings about the da Vinci Surgical System? The FDA issued a safety communication regarding the da Vinci Surgical System and other computer-assisted surgical systems a few years ago after an increased number of adverse event reports flooded the agency. Adverse event reports are submitted to the FDA by patients, doctors and drug and device manufacturers. The FDA’s communication acknowledged the number of reports it had received and said most of them pertained to device malfunctions, mechanical problems or image and display issues. Some of the reports, however, pertained to injuries and even deaths associated with the device, the agency said. The FDA said it would be working with professional societies to encourage training and education associated with the use of the da Vinci robot and other equipment like it. Despite the safety communication, the FDA has not issued a recall of the da Vinci Surgical Robot. Is robotic surgery better than traditional surgery? Evidence shows that robotic surgery is better than traditional “open” surgery when it comes to patient outcomes. However, the thousands of studies on robotic surgery have not shown that it is better or worse than minimally invasive surgery in terms of patient outcomes. Minimally invasive surgery, also called laparoscopic surgery, was introduced in the early 1990s. It dramatically improved patient outcomes compared to traditional “open” surgery that required larger incisions. Both laparoscopic and robotic surgeries use significantly smaller incisions to perform procedures compared to tradition surgery, and both reduce the amount of pain and recovery time of patients following the procedure. Though robotic and laparoscopic surgeries have advantages over traditional surgery, robotic surgery may not have significant benefits compared to laparoscopic. One 2013 study of over 260,000 hysterectomy patients published in the Journal of the American Medical Association found that though patients were less likely to stay in the hospital for more than 2 days following robot-assisted surgery, there was no significant difference in complications or the number of blood transfusions compared to minimally invasive laparoscopic surgery. There is one clear disadvantage of robotic surgery over laparoscopic surgery: the price. Robotic surgery costs hospitals thousands of dollars more than laparoscopic surgery to perform the same procedures. The same 2013 study that measured hysterectomy patient outcomes found that robotic surgery cost hospitals almost $2,200 more per procedure than laparoscopic. Who invented the da Vinci Surgical System? The da Vinci’s robotic technology was developed under contract of the United States Army. The first prototype of the da Vinci Surgical System was created in the late 1980s at the former Stanford Research Institute (now SRI International). Intended for the battlefield, the system would have allowed military surgeons to operate remotely on wounded soldiers, but its commercial opportunity was evident to a man named Dr. Frederic Moll. In 1995, Dr. Moll co-founded a new company, Intuitive Surgical Inc., with business partners John Freund and Rob Younge and purchased the rights to the surgical system. In 1997, the first prototype was ready to be tested, and by 2000, the company received clearance from the FDA to use the robotic device in general laparoscopic surgeries. Are there lawsuits against the maker of the da Vinci Surgical System? Patients who were harmed after undergoing robotically assisted surgery using the da Vinci Surgical System have begun filing lawsuits against the device’s maker, Intuitive Surgical Inc. The lawsuits claim that safer alternatives were available and that design defects in the da Vinci system may have been responsible for serious and possibly life-threatening injuries. If you or a loved one were harmed during a surgery using the da Vinci Surgical System, please do not hesitate to act. Call National Injury Help today at 1-800-214-1010 or use the form on the right-hand side of your screen.